Last year, Costa Nikias of Melbourne's farmhouse ale specialists La Sirene announced he was intending to construct a coolship inside the shed where he stores many of his oak barrels. The aim was to be able to spontaneously ferment several thousand litres of wort using the native yeasts and bacteria that exist in the nearby Darebin Creek and Parklands, thus creating an "urban farmhouse" ale. The coolship has been designed and built and is awaiting full installation and more suitable weather in the brewery warehouse, but already the brewery's first 100 percent spontaneously fermented beer is available in bottles in specialist stores. 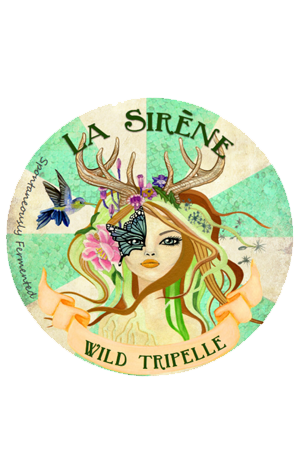 The Wild Tripelle was brewed in open fermenters and had no yeast added by the brewers. They instead allowed the wort to ferment at its own rate – taking five months, where most commercial beers go from brew day to bar or bottleshop in the space of a few weeks. Built upon a Belgian style Tripel base, Costa says the beer has "strong citrus and funky lemon notes", "a full bodied, creamy mid-palate and finishes dry and lingering with a memorable malty / wild ale finish." Since posting this, we've had a taste and are in agreement; indeed the "strong citrus" has a real Madeira cake character to it: intense and full-bodied. What's perhaps most notable, however, is how well integrated the flavours and aromas are – the beauty of being patient and allowing the native microflora to do their work for so long until the beer was ready.